Who's ready for a big scoop of vanilla? Xander is a contradictory mix of joke guy and angry guy and is often the truest true-to-life character. He is the accidental hero who inadvertently comes up with a great idea or who surprisingly stakes a vampire. And he's not going to be anybody's buttmonkey any more. Played by Nicholas Brendon, Xander Harris is the last member of the Scooby Gang that you'd expect to see as an action figure. He barely seems to belong - he's got no powers, no special skills, and bruises easily. Yet because of his dedication to his friends, he'll always stand by their side, through any life-or-death situation. Which is pretty handy, since it's "life or death" pretty much every damn day. For a while there was a rumor that he was up for the role of Peter Parker in Spider-Man, which would have at last given Brendon the chance to have some powers, but no, it obviously wasn't meant to be. Xander remains the generic guy. Hey, at least he was never written out of the series - that's what usually happens to his character type. Xander has an affable charm that carries him through even the stickiest situations. Zombies planning to blow up the school? No problem. Turning into a fishboy? Sure, okay. Magic spell that creates a hypno-doppelganger? He can deal. Xander is part of Series 3 of the Buffy line, which really should have been called "Series 2½." Not counting variants, there are only two figures - Xander and Cordelia - and both come with the same type of ornate graveyard bases as Series 2. 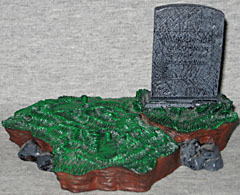 Xander's tombstone (not his tombstone, but the one on his clump of dirt) has sculpted letters which read "I laugh in the face of danger. Then hide till it goes away." His figure doesn't come with the same exotic and elegant weaponry that Buffy or Giles did - he's got a few stakes, a fire axe, and a tranq gun (perfect for stopping rampaging werewolves). If you want him to hold the axe or gun, though, be prepared to get out the old X-Acto knife; you'll have to separate his thumb and forefinger to get anything but the stakes into his hands. Articulation is average for this line, with joints at the neck, shoulders, biceps, elbows, forearms, hips, thighs and knees. The head is definitely isn't up to the usual standards we've come to expect from MAC - go look at any of the Series 2 figures, and compare their likenesses to Xander. Sure, you can tell this is supposed to be Nicholas Brendon (or his twin brother, Kelly Donovan); he's got the tousled hair and that same smirkish grin. 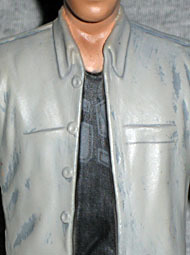 But overall, the detail is really soft, making him puffier than he should be. To say nothing of the fact that his ears are too high on his head. Below the neck, though, things are (mostly) okay. The hands are a bit sharper than the face, so that's a plus. The clothes, meanwhile, are all great. Xander's dressed in jeans and a t-shirt, with longer shirt over top. The layered look works nicely, with the differences in the depth of the material really selling the notion that these are separate pieces of clothing hanging over one another, rather than a solid sculpt. That's a tough illusion to pull off, but the Xander action figure manages. The paint here is good, including the obscured "69" on his t-shirt, though the shadows painted on his face are as poor as the underlying sculpt - heavy and striped. Like all but one of the Buffy figures released so far, Xander has a variant. The odd man out, in case you're wondering, was The Master, who was all by himself back in Series 1 - after all, what else were they going to do to him? It's not like he ever changed outfits. Anyway, Xander. 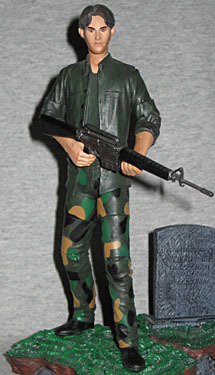 His variant comes from Season 2, showing Xander in his military uniform. Like Cheerleader Cordelia, Military Xander shares the same basic sculpt as his mass-market brother, just with a new paint app: camouflage and olive drab, just like you'd expect. The body's pose is neutral enough to work for both versions, being neither too scared nor too confident. Instead of a dart gun, though, this soldier has an M-16. Xander may be the last average human on the show, but he still makes a good figure; heck, even Zeppo was an important part of the Marx Brothers.